Having connectivity wherever you go is important to us here at weBoost. We think having a strong network connection in the airport is especially important. Nothing feels like more of a waste of time than sitting in a terminal waiting for your flight, and not being able to respond to an email, or send your boss the latest report. When free time is so hard to come by, we think taking advantage of every minute is vital. If you spend a lot of time in busy U.S. airports, Verizon Wirelessand T-Mobile US are likely going to offer you better overall performance and mobile data speeds than AT&T Mobility and Sprint, according to the latest bi-annual report from network testing firm RootMetrics. In its latest test of airport network performance, the firm used web and app access rates and task success rates as indicators of network reliability. Access rates showed how often the firm was able to connect to a network during web/app testing, while task success rates showed how often RootMetrics was able to complete a web/app task. The firm noted that a threshold of 97 percent success “is a high bar and reflects performance that would pose little to no noticeable disruptions to everyday activity.” RootMetrics also measured median downlink and uplink speeds of the carriers. The firm used a 20 Mbps threshold to indicate “lightning-fast download speeds” and 10 Mbps as a measure of excellence for upload speeds. RootMetrics’ report found Verizon in the lead. With 31 wins, Verizon won the most first-place Airport RootScore awards of any network by far in the second half of 2014. According to the report, Verizon fell below 97 percent in web/app access success at only two airports and below 97 percent in web/app task success at only five airports. It had by far the most airports with median download speeds of 20 Mbps or higher and median upload speeds of 10 Mbps. T-Mobile, which has made significant improvements to its LTE coverage and speed in major metro areas, came in second with 17 wins or ties. “T-Mobile offered excellent data performance at many of the airports we tested,” RootMetrics noted. “T-Mobile beat all other networks in number of airports with task access rates of 97% or above.” The carrier also performed well in median upload speeds, coming in second only to Verizon in the number of airports with median upload speeds of 10 Mbps or more. However, it came in third in the number of airports with task success rates at the 97 percent threshold as well as the number of airports with median download speeds of 20 Mbps or more. AT&T fell behind T-Mobile in the tally of Airport RootScore awards, with 10, and its median upload speed and web/app task success rate results were possible factors in the carrier slipping. However, AT&T did quite well in download speeds, second only to Verizon in the number of airports with median download speeds of at least 20 Mbps. Further, AT&T was also second only to Verizon in the number of airports with web/app access success rates of 97 percent or above. Sprint clearly has some catching up to do in terms of its performance at airports. Although the company expanded LTE coverage to 260 million POPs by the end of 2014, it is only using 5×5 MHz spectrum blocks for its 1900 MHz LTE network, which inhibits its speeds. The company also deployed its faster 2.5 GHz TD-LTE network to more than 100 million POPs by the end of 2014. 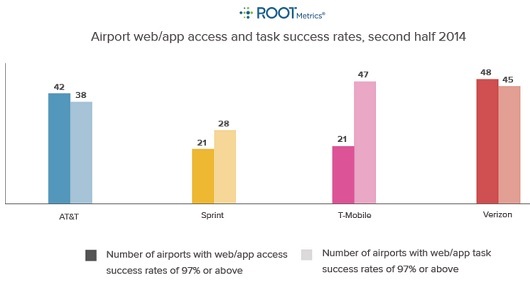 RootMetrics said Sprint had the lowest number of airports with web/app access and task success rates above 97 percent. There was only one airport where Sprint provided median download speeds above 20 Mbps or median upload speeds above 10 Mbps. In terms of how individual airports fared, Memphis International, Pittsburgh International, Chicago’s O’Hare International, Southwest Florida International in Ft. Meyers, Fla., and Dallas’ Love Field were ranked the highest in terms of overall performance. San Diego International Airport was the worst-performing airport, according to RootMetrics.